Your sightseeing tour will start from the Independence Square, where you will see the Kazakh Eli monument, Khazret Sultan Mosque, Palace of Peace and Accord and other architectural objects. Then the tour route will take you to the left bank of the river with its business centers, administrative buildings, skyscrapers, shopping and entertainment centers. 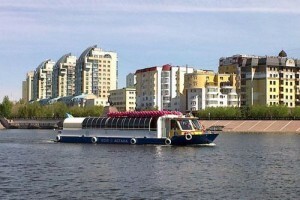 Finally, you will cross the Ishym River and will start your amazing 40-minute boat trip from the embankment near the Alatau Grand residential complex. Add a little romanticism in your travel to the country’s capital! Who knows, maybe Astana would never become the capital if there was no Ishym River, which played an important role while transferring the capital of Kazakhstan from Almaty.